A man has landed in serious trouble after he reportedly slashed his stepmother's throat. The middle-aged man has been arrested after killing his stepmother in Rivers state. The incident took place on Tuesday, at their home. They reside in Cocaine village, Rumuogba, Port Harcourt. The deceased was picking beans when she was attacked by her stepson. Her scream alerted her biological son and he ran to the scene to find his mother bleeding from the neck and his stepbrother close by. He ran out for help but on returning, his stepbrother had locked the gate and wouldn't let him in. The son then raised alarm and neighbours gathered. The police were also contacted. 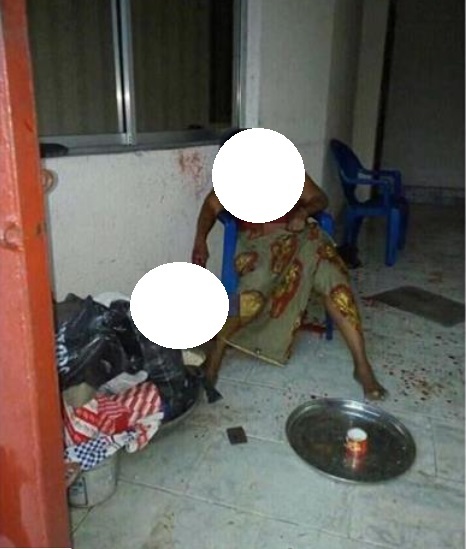 By the time they gained entrance into the compound, the woman had bled to death. The suspect has been arrested but the motive for the attack has not been revealed.